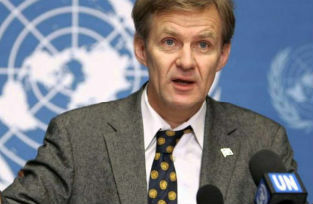 Jan Egeland was one of the chief architects of the Oslo Accords, the secret negotiations between Israel and Palestine (1993-94) while Secretary of State in the Norwegian Ministry of Foreign Affairs. Spanish news site eldiario.es spoke to him on the 50th anniversary of the occupation. Almost a quarter of a century ago, representatives of the Israeli government and the Palestinian Liberation Organization (PLO) signed the Declaration of Principles on Interim Self-Government Arrangements (13 September 1993) which culminated in the signing of what became known as the Oslo Accords. Norwegian Jan Egeland still remembers it well. He was one of the people who initiated and organized the secret negotiations between the two sides during his time as Seretary of State in the Norwegian Ministery of Foreign Affairs between 1990 and 1997. On his last visit to Palestine, marking the 50th anniversary of the occupation, Egeland spoke to eldiario.es about the systematic human rights abuses still taking place in rural areas of the West Bank – five decades after the Six Day War – and about the humanitarian crisi in Gaza. You were one of the co-organizers of the Norwegian channel between Israel and the Palestine Liberation Organization which culminated in the Oslo Accords. Now there is talk in the region about the need to revoke the accords in order to move forward in the peace process. Do you agree? In 1993-1994 we had high hopes for the success of the Oslo Accords, but it is now clear that we failed. However I believe some of the agreements adopted at the time could still be used as a basis for future negotiations, seeing that the original aims of the provisional Accords have still not been achieved. The international community, and the EU in particular, have to be harder on Israel to guarantee that they respect human rights and that they put a speedy end to these 50 years of occupation. In your press conference you criticized both the current Israeli government and the Palestinian National Authority for not having resumed negotiations. Is one side more at fault that the other? I would start by saying that we are seeing a leadership failure on both sides. For over a month, Palestinians in Gaza have had their electricity supplies limited to two to four hours a day, and the sewage treatment works have drastically reduced their operations due to the inability of the political elites in Ramallah and Gaza to agree on minimal conditions which would allow them to provide essential services to the civilian population. But, most importantly, the Gaza Strip is a heavily populated enclave which has been under seige from Israel for the last ten years. During this time Israel has tightened its grip on Gaza’s two million inhabitants, provoking a decline in humanitarian conditions and devastating the economy. What about the West Bank? What we are witnessing is a systematic attempt to make it difficult, even impossible, for Palestinians to live and prosper in the West Bank, with the Israeli government now taking new legislative measures as a step towards the unilateral annexation of Area C (designated in the Oslo Accords, Area C refers to rural areas of the West Bank, which are rich in natural resources and which have a smaller Palestinian population). Just two days ago, the Israeli government approved the further expansion of settlements there with the construction of 2,000 new dwellings. 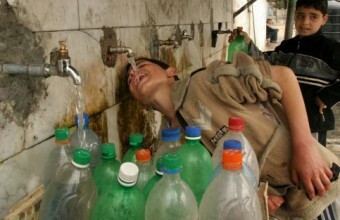 95% of water from the aquifers in Gaza is not fit for human consumption and requires treatment. How much responsibility for the political stalemate of the last three years should be born by the international community? (taking former US Secretary of State, John Kerry’s efforts as being the last round of negotiations). Can something different be done at this stage? That remains to be seen, because there has also been leadership failure on the part of the international community when it has come to promoting a peace agreement with any hope of success. We are seeing a flagrant subversion of public international law and international humanitarian law. The EU and its member states,along with the United States of America, have a fundamental role to play in reestablishing a prospect of conflict solution, helping the Palestinian factions to overcome their internal political differences and holding Israel to account for its illegal actions. You mentioned that during your current visit to Gaza and the West Bank you were witness to the terrible humanitarian situation there. What needs to be done to guarantee the protection of the civilian population? Already two generations of Palestinians have grown up under the occupation and have faced a situation of desperation and disillusionment. The young people I met in Gaza last Monday told me that their dreams had been demolished along with their homes during the most recent war. We can’t allow another generation of Palestinians to be denied a life of peace and security. The international community must continue to provide essential humanitarian aid to the most vulnerable Palestinians. In fact it is doing that, by helping them procure their most basic necessities. Nevertheless, in the final analysis, the diplomats are the ones who have to enforce the respect for International Law so that both sides can reach a peaceful solution. The humanitarian aid organizations are tiring of building and rebuilding only to see their efforts destroyed time and time again. You have said that a humanitarian organization like the Norwegian Refugee Committee (NRC) has had to provide legal aid seeing that the foreign diplomats were not doing so. Are the consulates, embassies and offices of international representatives fulfilling their duty in this regard? What I meant was that humanitarian organizations like the NRC, which I am currently heading, have been converted into providers of legal assistance. This assistance based on international humanitarian law and human rights, is provided to those Palestinians living under the occupation who are most vulnerable. Let’s just say that foreign diplomats are not fulfilling their obligations to protect the Palestinian people under occupation. Israel’s methods include the demolition of homes, schools and medical clinics, and the enforced displacement of families far from their birthplace. The occupation of land and the negation of basic services – including education and healthcare – go hand in hand with the building and expansion of Israeli settlements. Humanitarian aid, along with decisive political action on the part of the international community, is essential in order to prevent and reverse these violations of international law. In your time as a diplomat in the region, the PLO was considered a terrorist organization. Now it is Hamas that is viewed as such by Israel and the USA, and to a lesser degree, by the EU. Is there scope for political manoeuvre in negotiating with them? The reconstruction of Gaza and the lifting of the seige of Gaza could be achieved while still maintaining Israel’s security, but this is a question of political will and leadership from the international community. Israel must make peace with her nearest neighbours. The most recent armed conflict clearly demonstrated that the status quo does not protect families, on either side. The blockade of the Gaza Strip – which is now in it’s 10th year – has meant the collective punishment of two million Palestinians, cutting them off not only from the rest of Palestine but also from the world. Israel, as the occupying force, is responsible for the wellbeing of the civilian population in Gaza. At the meeting I had with families from Beit Hanoun (in the north-east of Gaza), whose homes had been damaged time and again by the war, it was plain to me that the blockade is affecting the most vulnerable sections of the population.